Madhya Pradesh is given the value of ‘heart of India’ for a reason, Located in the center of the country, it is a regal state brimming with several historical places, hill stations that you can explore on your honeymoon. The rich culture, art & craft and history of the state attracts newlywed couples from across the country. If you want to get closer to the history and culture of India with your partner, choose from these perfect honeymoon places in Madhya Pradesh. Planning your honeymoon in Pachmarhi, MP is a great idea to escape into the serenity of the hill station. Located along the Satpura Range, there are several tourist attractions around the tiny yet amazing Pachmarhi such as Jata Shankar Caves, Bee waterfalls, Mahadeo Temple, etc. You can spend a pleasant evening with your beloved at the calm Pachmarhi hills for a perfect romantic experience. Things to do: If you both are adventure lovers, going on a biking trail in the Pachmarhi hills is a great idea. You can go for trekking together. Take a deep dive in romance while alluring the breathtaking view of Sunset at the sunset point in Rajendragiri. This one is for the couple who are inclined towards the wildlife of India. Do you love exploring wildlife in the country? If so, what could be better than doing what you love with your partner! You must visit Bhandavgarh National Park for an adventurous honeymoon. Sounds different? Well, so is the experience. The lush green forests provide shelter to a wide range of wild animals such as Royal Bengal Tigers, Langurs, White Tiger, Elephants, Deer, Primates and some endangered species. Things to do: Book the Tree House Hideaway for a romantic stay amidst dense forests and wildlife. Do not miss the Jeep safari with your partner. Another great option for honeymoon in MP is Amarkantak, a place with superb topography – thick forests, Narmada and Sone River flowing opposite to the forests and lush green hills of Satpura Range. Doesn’t it feel like an amazing place for honeymoon in the state of Madhya Pradesh? Things to do: Go for a rejuvenating dip in the Dhuni Pani hot water spring. If anyone of you is a bird watcher, plan a day of your honeymoon trip for Pench National Park. Situated by the Pench River, the national park is engulfed by Satpuras and is highly rich in biodiversity. You can spot variety of wild animals like wild boar, sloth bear, Indian Bison and Royal Bengal Tigers. Things to do: Pench is a shelter to endangered bird species. You will love the experience of bird watching with your beloved in the evening. Going to Rewa for honeymoon in MP will bring you the experience of a perfect romantic retreat. One thing that couples seek for a romantic holiday is peace and Rewa offers it in abundance! The small but picturesque town in the state has some of the attractive places to visit such as Keonti Waterfall, Rewa Fort and Govindgarh Palace. Things to do: Visit Rani Talab – as per belief, anything you wish by the pond will come true. Try your luck! Want to unravel the history of the state with your partner? 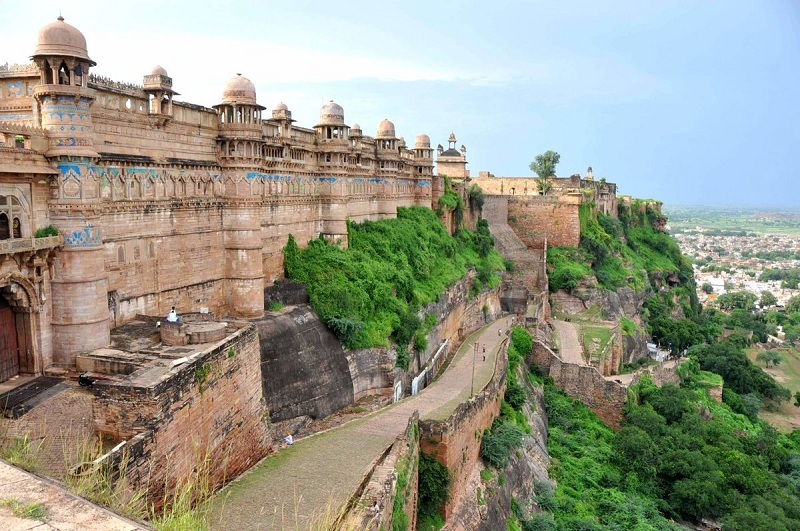 Madhya Pradesh has several historical spots out of which, Gwalior Fort is the most prominent across the country. The city of Gwalior brims with glorious palaces, forts and museums that reflect the history of India. Want to visit as soon as possible with your partner? You can even have the benefits of booking cheap last minute flights Indian Eagle. Hurry up! Things to do: Allure the charming Gwalior Fort, explore the interiors and sit by the banks of Yamuna. Also visit Jai Vilas Palace, Man Mandir Palace, Gujari Mahal, and Scindia Museum. Also famous as Hampi of Central India, Mandu Fort is an architectural marvel in the city of Mandu, settled on a hill. The city has plenty of monuments you can explore with your partner such as Jahaz Mahal, Rupmati’s Pabilion, Ashrafi Mahal, and Hoshang’s Tomb. Things to so: As a couple, you can spend a mesmerizing evening watching the spectacular sunset at Rupmati’s Pavilion. It is one of the popular honeymoon places in India among couples with a love for Indian culture and history. The series of love temples in Khajuraho will bring you the eternal romantic evenings of your life. As newlyweds, you will be allured by the master architecture of the ancient Khajuraho Temples. Things to do: Get fascinated by the intricate art work on the temple walls of Khajuraho, the UNESCO World Heritage Site.